Consumer groups have expressed anger as British Gas owner Centrica revealed £5m-per-day profits, after announcing a record price hike on Wednesday. Centrica defended the price rise, and pointed to the high wholesale gas costs that had cut its profits by 20% to £992m during the first half of 2008. 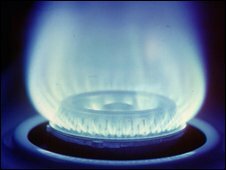 Energywatch said the size of Centrica's profits and the 35% price increase by British Gas would outrage consumers. Age Concern warned that many pensioners would be unable to pay for winter fuel. The earnings report and anger at the planned price increase comes at a time when the UK is having to rethink the whole of its energy strategy. Why has BG made a 35% hike in prices when they have only taken a 20% hit to profits? Falling North Sea oil and gas production, coupled with record wholesale prices, have increased pressures on policymakers, companies and consumers. Energy Minister Malcolm Wicks told the BBC that Centrica's results needed to be seen in context. "I know as energy minister, we need massive investment in new energy infrastructure, power stations," he said. "I'm not going to play a populist card saying profits are wrong when I know that profits are needed to invest in energy in the future to keep our lights on". A committee of MPs recently warned that higher gas and electricity bills would have serious consequences for millions of households. The committee was worried that the UK's energy markets were not functioning "as efficiently as they should". After Centrica's results, a group of council leaders said energy suppliers should be subjected to a £500m annual charge to beat fuel poverty and cut carbon emissions. Paul Bettision, chairman of the Local Government Association's environment board, said: "Energy companies are making massive profits at the expense of hard working families." Centrica's move to increase prices on Wednesday came after EDF Energy raised prices last week. Analysts say other firms are likely to follow suit. Adam Scorer, Energywatch's campaigns director, said households would be "staggered" at Centrica's profits. He added that customers would be outraged "to learn that while they ponder how to make ends meet, Centrica's shareholders are enjoying an increase in their dividends". Patrick South, Age Concern's head of public affairs, said: "Energy companies say they can't absorb wholesale price rises, but in light of their profits this will sound hollow to the one-in-three pensioners likely to be in fuel poverty this winter." Centrica said the rise was justified and was needed to offset higher costs. British Gas said it raised gas bills by 35% to restore "reasonable profitability". Sam Laidlaw, Centrica's chief executive, said: "This is a business that has got a million shareholders - a lot of pension funds and people have got their savings invested in British Gas shares and we have to look after them". Phil Bentley, British Gas managing director, told the BBC: "The price of gas for this winter, even though it's fallen a little bit, it's still double what was last year." Centrica said the results were "good" given the tough market conditions, and said it would raise its dividend to 3.9 pence a share from 3.35p. Its shares closed 3.25 pence, or 1%, lower at 314.75p.